Memorial Day Miami 2010 a/k/a/ Urban Week Week 2010 will take place May 27 – May 31, 2010, on the sunny beaches of South Beach ( Miami Beach, FL ). Last year saw a slight reduction in the crowd size, but it was the largest black event of 2009. Where should I stay for Memorial Day Miami 2010? The area where all the haps happen is: Lincoln Road to 5th Street (North to South) and from Ocean Drive to Washington Avenue (East to West). There are some historic Art Deco themed hotels on Ocean Drive, these hotels will have you in the middle of the action the entire weekend. They fill up quickly, but don’t worry – Any hotel in Downtown Miami or on Collins Avenue up to 41st Street will have you close enough. Details of artists, club specials and more coming soon. 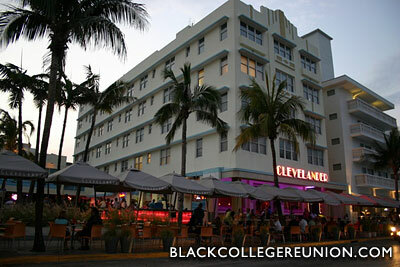 Become a fan of Black College Reunion on FACEBOOK to get updates on Memorial Day Miami 2010 as they become available. Black Bike Week 2008 Was Great! I just recovered from the non-stop party called Memorial Day Weekend. Me and the crew started out by flying out to Myrtle Beach. Once we touched down we headed straight for Ocean Blvd. and walked for miles! Im surprised I didnt end up with blisters from all of the footwork I put in. The ladies were nice and plentiful. I will admit that was the largest crowd I’ve experienced since I started attending years ago. As a bonus, I had a nice convo with a couple lovely ladies from Alabama who work for Honda. After a couple days in Myrtle Beach, we got back on a plane and headed down to South Beach to catch some of the action Ocean Drive. Once again, our feet hit the pavement and put in more miles! We met quite a few pro sports players, actors, rappers and producers. It seemed like everyone was on the beach this year. The ladies were looking delicious as always. Memorial Day Miami 2007 Official Meet & Greet Party! The Official Memorial Day Weekend Meet & Greet will take place at the Clevelander Hotel, 1020 Ocean Dr, Miami Beach, FL 33139 Fri. May 25th @ 2pm, Appetizers will be provided. Get ready to have a good time!! I posted a few pics from last year’s action in the Picture Gallery! Memorial Day Miami also known as Urban Beach Week 2007 will be held May 25 – May 28, 2007 on the world famous Miami Beach, FL. Come down and mingle with beautiful people from all over the country and world. Last year over 350,000 people came and got wild! Even though the majority of the action is on the streets, make sure you bring some cash with you because the clubs are pretty expensive during this time. The crowd is laid back and the police presence is visible but they dont interfere with the activities because they are use to bigger crowds (unlike smaller cities). South Beach (Miami Beach, FL) has become the place to be for Memorial Day for the hip urban crowd in recent years. Each year the crowds have grown. If you are fortunate enough to attend you will definitely run into hip hop recording artists, sports stars, Hollywood stars and load of beautiful people from all over the world. The atmosphere is more laid back and casual than other events such as Black Bike Week or Black College Reunion. During Memorial Day Miami, the attendees tend to converse, party and have more of a mature attitude. If you can make it, I suggest you come!